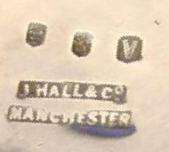 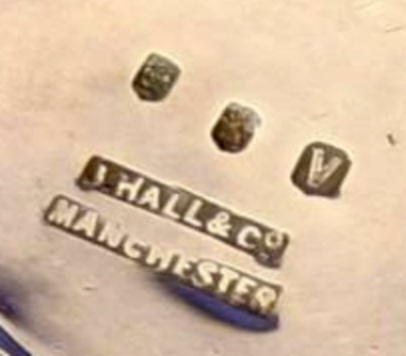 Origin of the business in 1830 as Hatfield & Hall, 68 King Street, Manchester. 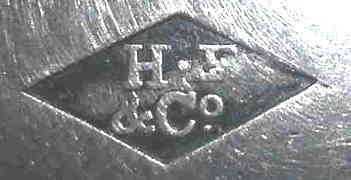 In 1860 the firm was restyled as John Hall & Co. by partners John Hall Sr, John Clapham, Willian Henry Hall and John Hall Jr. 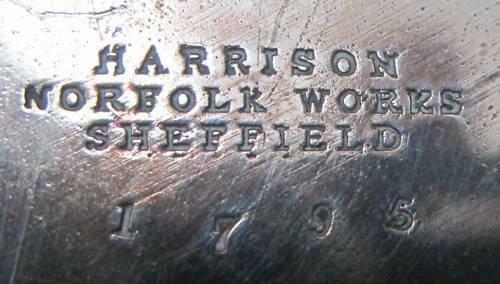 Founded in 1847 by James William Harrison, Henry Harrison and William Howson. 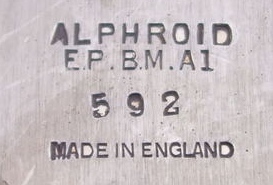 The firm, originally at Norfolk Street, Sheffield expanded in the 1880s to Shoreham Street Works. 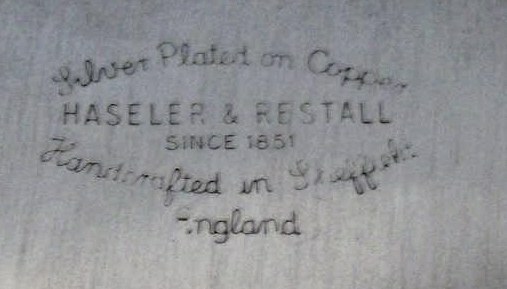 A new factory was built at Carver Street in 1898. 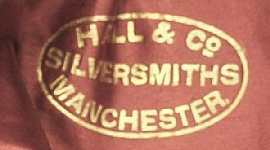 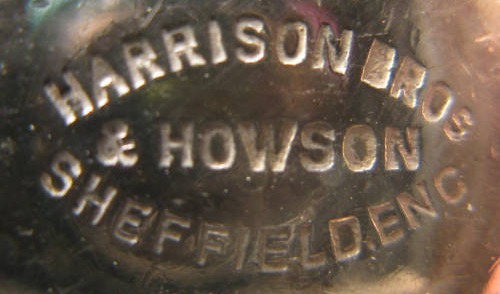 The trademark was taken over by Viners of Sheffield in 1923. 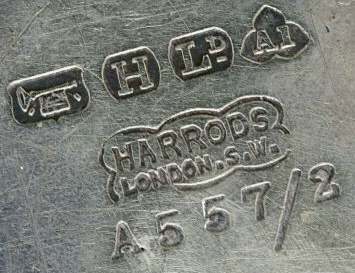 The Knightsbridge department store was founded in 1849 by Henry Charles Harrod. 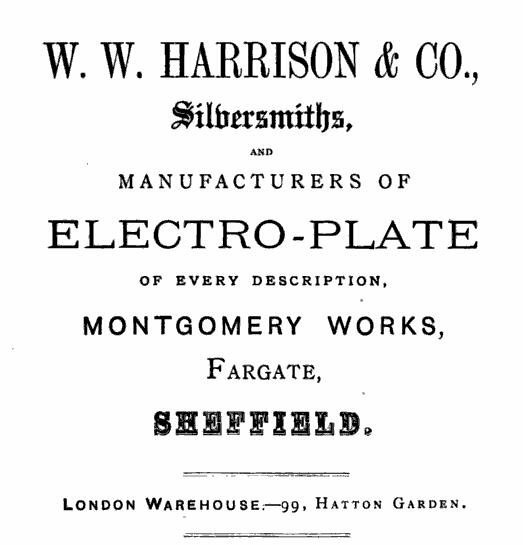 The business was converted to a limited liability company in 1889. 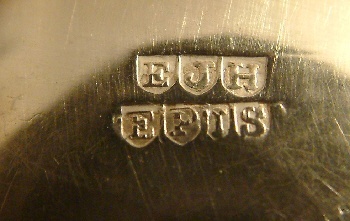 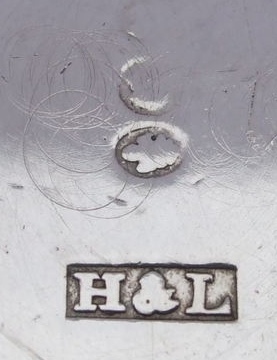 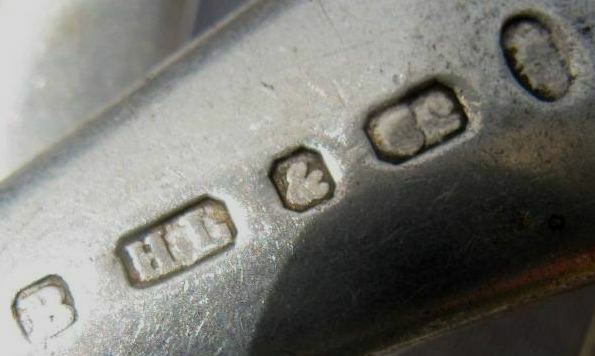 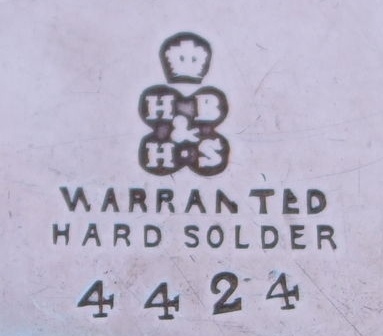 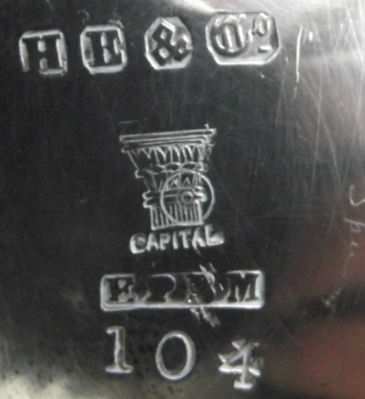 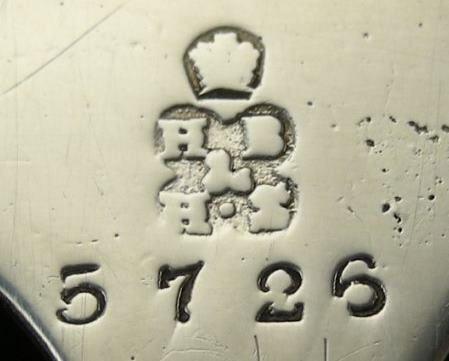 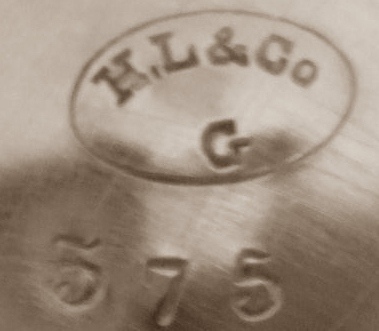 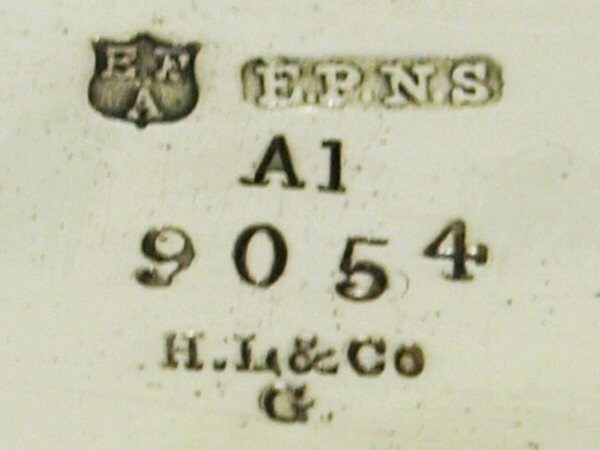 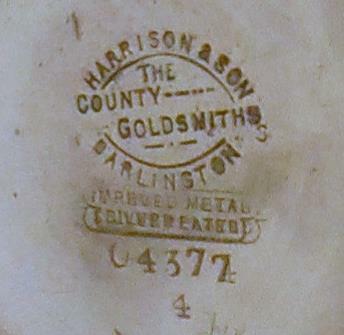 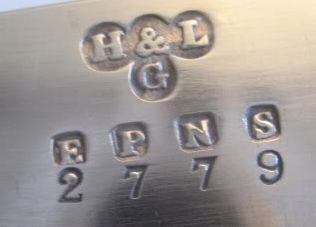 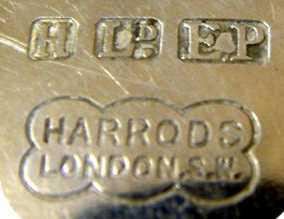 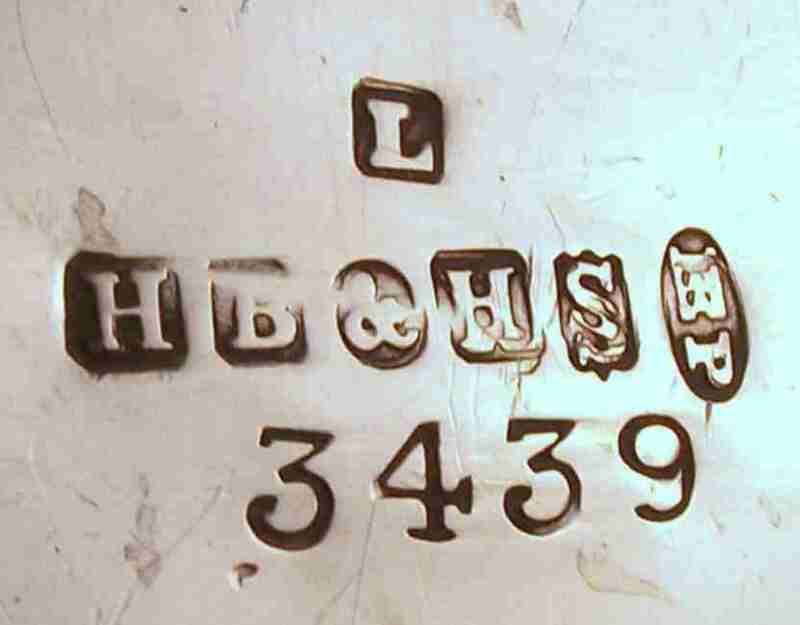 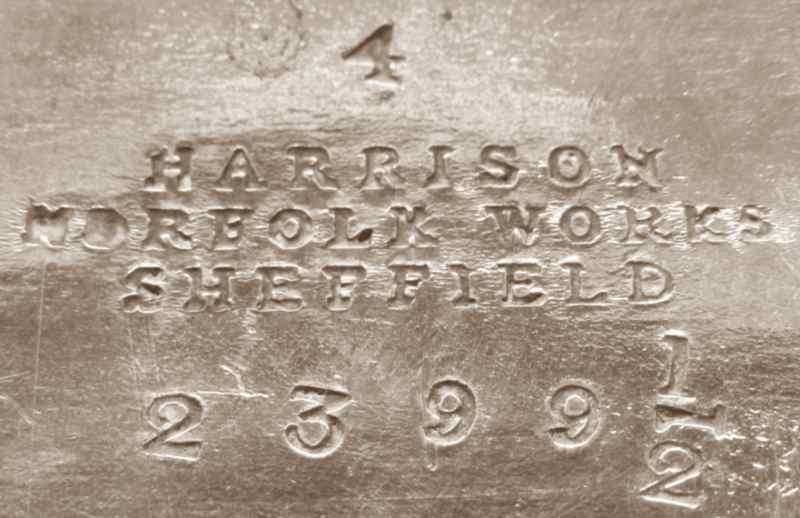 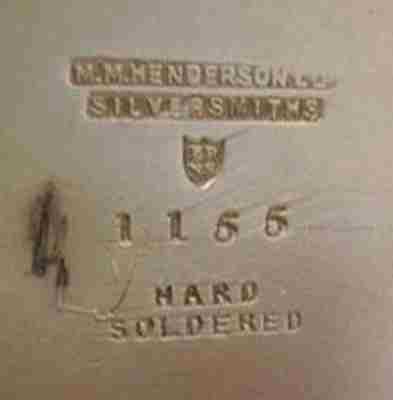 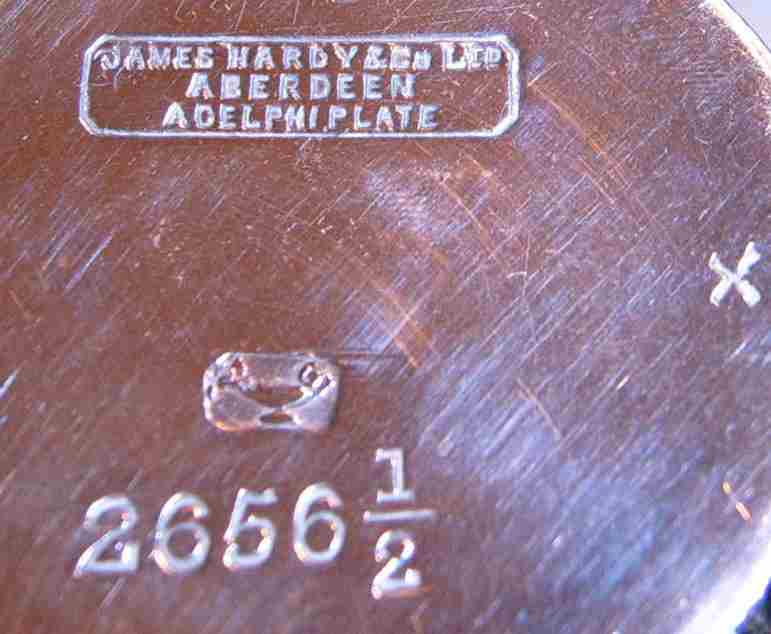 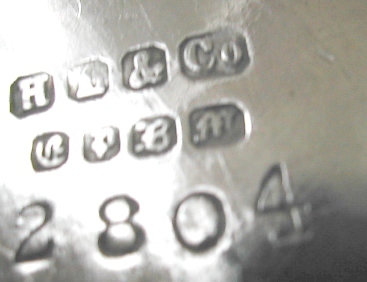 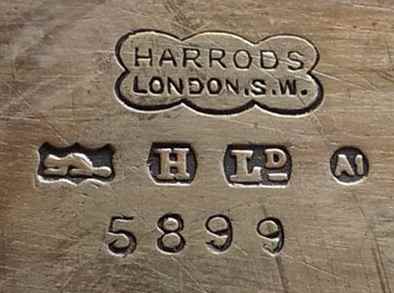 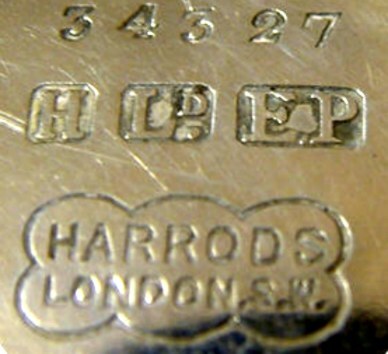 In 1928 Harrods Ltd bought Edwards & Sons and in 1934 Elkington & Co Ltd.
George Henry Hart (1882-1973) was one of the original silversmiths who moved with Charles Ashbee and the Guild of Handicraft from London to Chipping Camden in 1902. 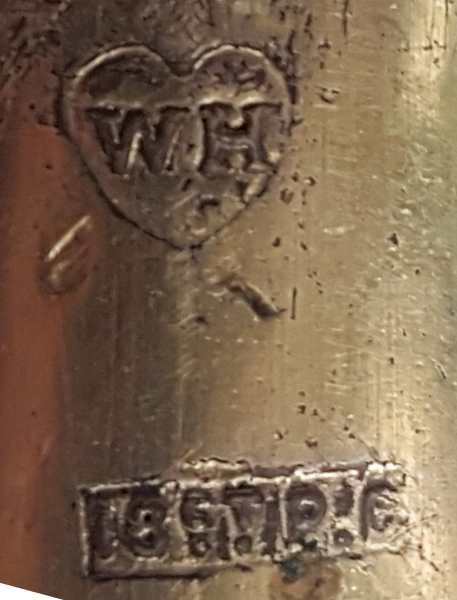 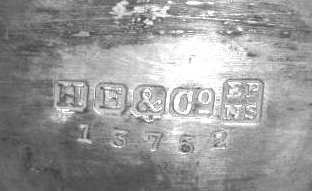 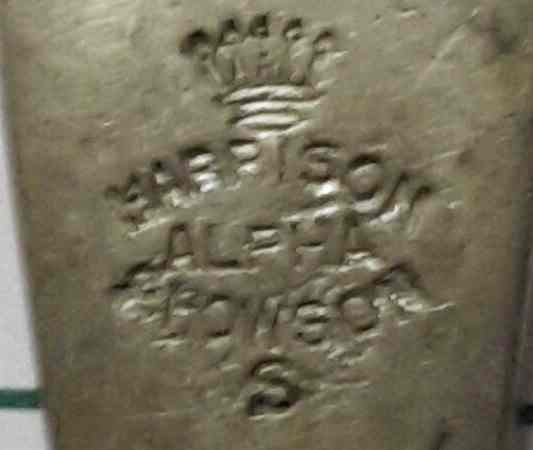 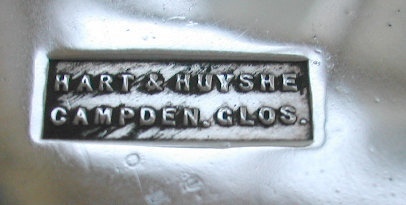 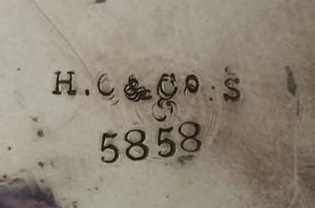 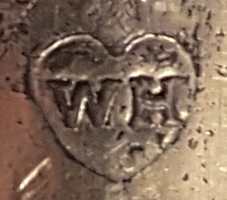 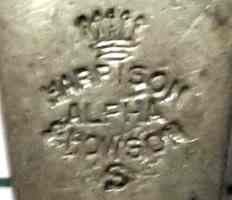 After 1933 he was joined by his half-brother Reynell Huyshe and the impressed mark on some metal wares was Hart and Huyshe, Campden, Glos. 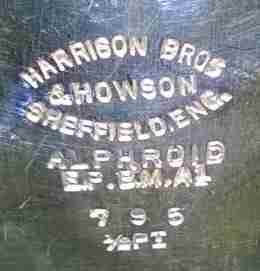 At 82 Tenter St. Sheffield from 1901 to 1904 as Hartley & Baxter & Co Ltd sharing its premises with S. Hibbert & Son. 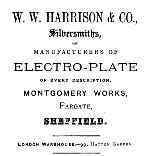 In 1905 moved to 7 Eyre Lane as Hartley & Baxter. 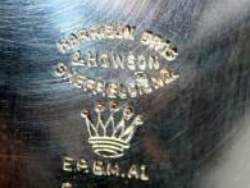 From 1933 to 1940 at 40 Matilda St. sharing its premises Harold Jay. 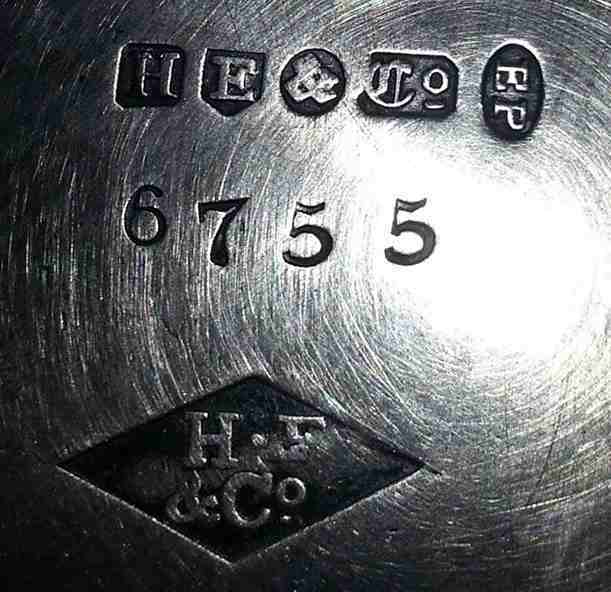 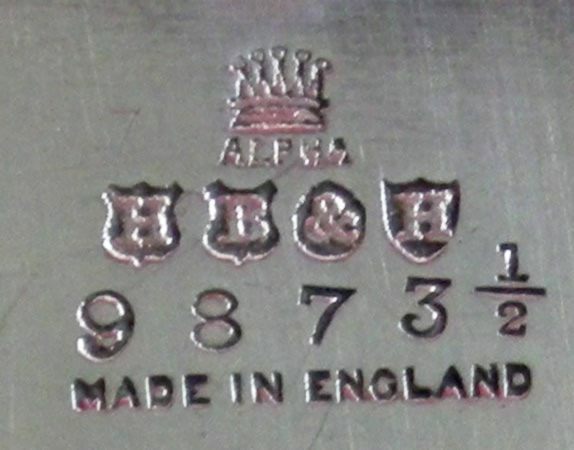 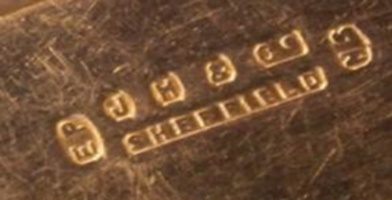 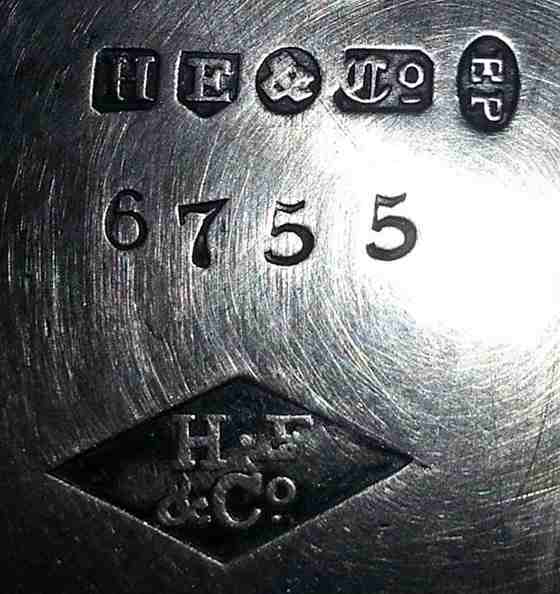 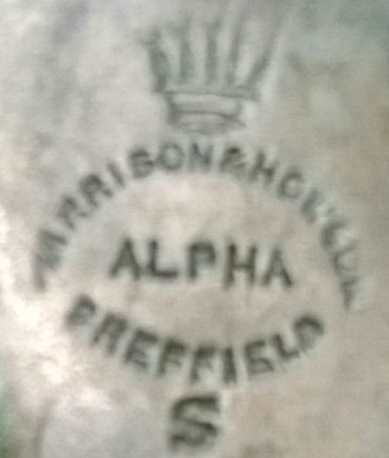 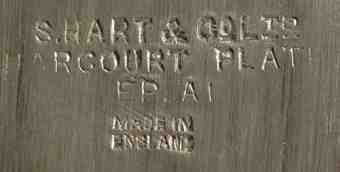 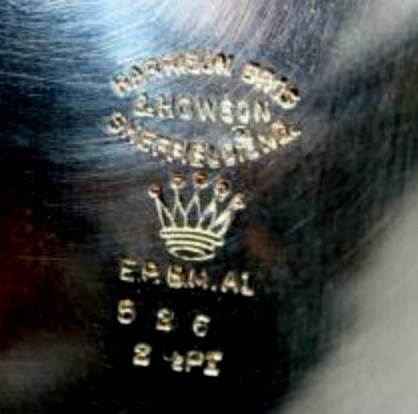 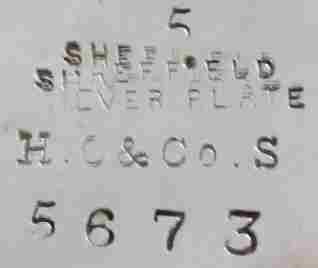 The firm started its trade in 1821 as Blagden, Hodgson & Co producing Old Sheffiel Plate. 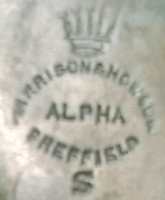 The firm was converted into Ltd in 1872. 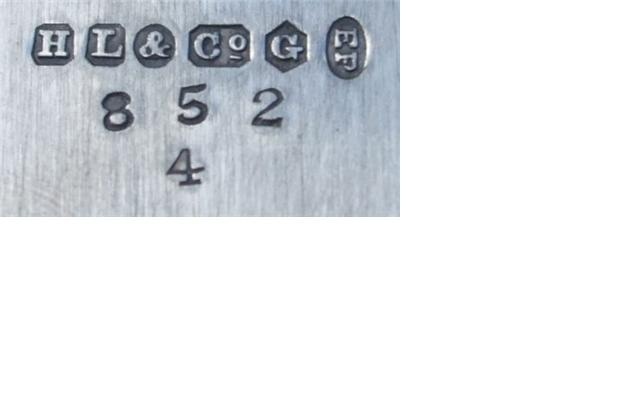 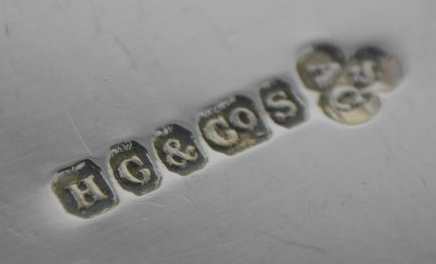 The letters C & J stand for Charles & John. 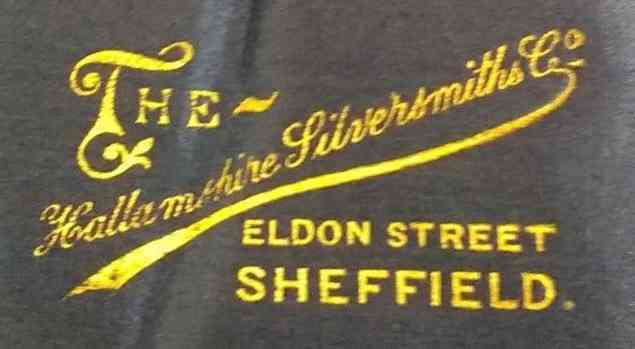 Active in Nursery St until 1878 and later in Rockingham St, Sheffield. 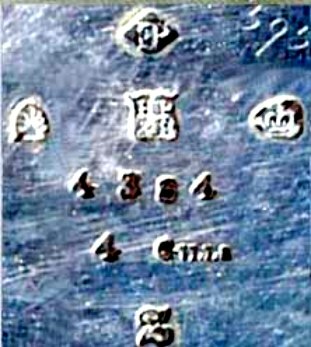 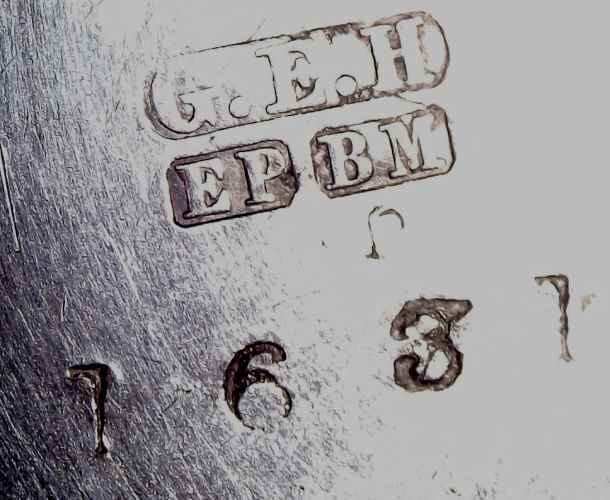 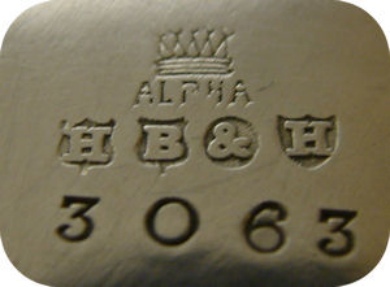 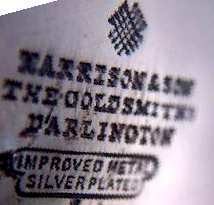 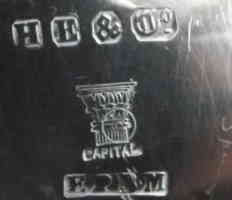 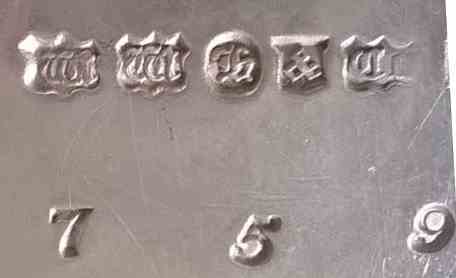 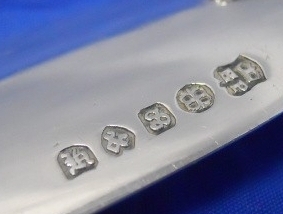 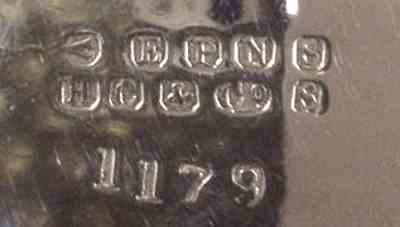 The firm used also the trademark SIBERIAN SILVER and CAPITAL. 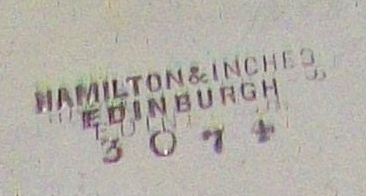 Established in Coatbridge by Matthew McLaren Henderson (1886). 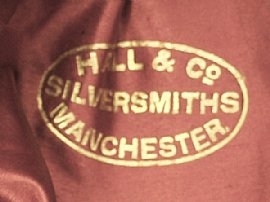 Converted in 1925 in M.M. 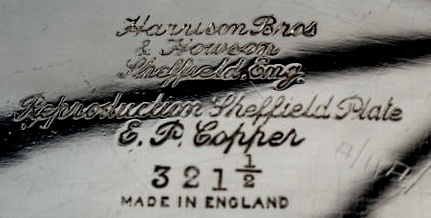 Henderson Ltd. 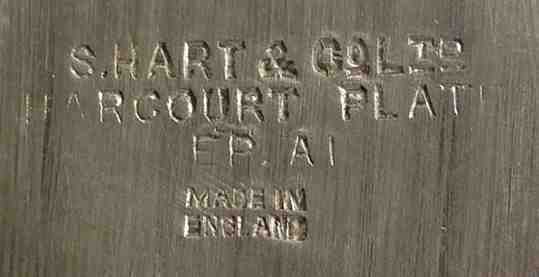 Active at 141-143 Argyle Street Glasgow, 143 Princes Street and Shandvick Place Edinburgh, Dundee, Aberdeen and Airdrie. 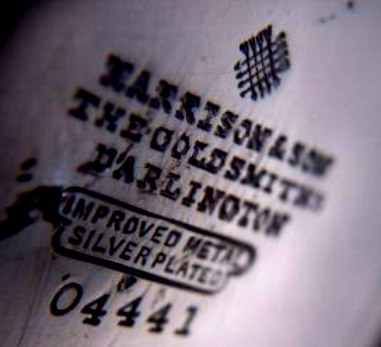 The firm, owned by Ketling Ltd, was placed in liquidation in 2013 and closed in 2014. 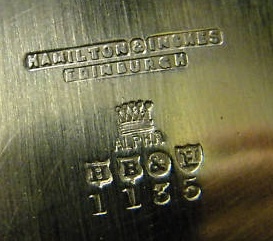 The firm traded as Henderson The Jewellers with branches in Airdrie, Ayr, Bishopbriggs, Braehead, Clydebank, Cumbernauld, Dundee, Dunfermline, Edinburgh, Glasgow, Hamilton, Kilmarnock, Kirkcaldy, Motherwell and Newton Mearns.